Ontario contractors, write up a Renovation Contract for a home owner with this easy-to-use template form. Materials. The contractor agrees to provide all required materials, labor, tools, equipment and supervision. Contract Price. Payment of the contract price, less required holdback under the Ontario Construction Lien Act, will be made in several payments, with the balance due on completion. Change Orders. A signed change order is required for any alterations to the work specified. Site Safety. The contractor is responsible for cleanup and for job site safety. Home Owner's Responsibilities. The home owner is responsible for providing utilities, toilets and access to the work site. Warranty. The contractor provides a 1-year warranty of the materials and workmanship and agrees to correct any defects of which it is notified in writing during the warranty period. Insurance. The contractor is responsible for maintaining adequate insurance, and for complying with the requirements of the Workers Compensation Act. Avoid any disputes or legal claims connected with your renovation project - put it all in writing in this Ontario Renovation Contract. Prepare a Construction Contractor Agreement for a residential construction project in Canada with this easy-to-use template. The contract price for the construction will be paid in installment payments. All labour, tools, equipment and materials required for the job will be provided by the contractor. The property owner must arrange for water, sewer, electrical, natural gas, and other utility hook-ups required to complete the work. The contractor is responsible for carrying adequate liability insurance for the duration of the project. This Canada Construction Contractor Agreement form is a fully editable and reusable contract template. 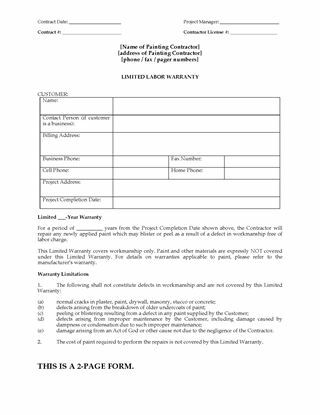 Canadian contractors, use this template to prepare a Fixed Price Construction Contract with Warranty for Canada. The contract includes a warranty by the contractor on materials and labour used in the construction. The contractor is responsible for Workers Compensation, public liability and property damage insurance, and all perils insurance, and indemnifies the owner against claims arising as a result of the contractor's operations. Changes to the work which are not included in the Construction Contract will be on the basis of either (i) a stipulated sum or (ii) actual cost plus a percentage. Disputes will be submitted first to the architect, and failing settlement, to arbitration. The Canada Fixed Price Construction Contract with Warranty form is available as a fully customizable MS Word document.